NovaTech 8000 I/O is ideal for new D/3® installations and for upgrading existing NovaTech 16000 Series I/O families in existing Process Control Module cabinets. Retrofit panels facilitate connection to new termination panels with minimal impact to existing connectors and wiring. All 8000 Series I/O modules are listed to UL 61010. The 8000 Series Ethernet I/O includes native capabilities for HART and can be configured in a unique and cost effective 1-to-6 redundancy configuration. With its -40° to +70°C temperature range and G3 corrosive coating, 8000 Series I/O is designed for field mounting. It connects to conventional and smart field devices through multi-channel I/O modules. The modules communicate with redundant Ethernet Bus Interface Modules (EBIMs) which provide dual-redundant high speed Ethernet data connections to the D/3. 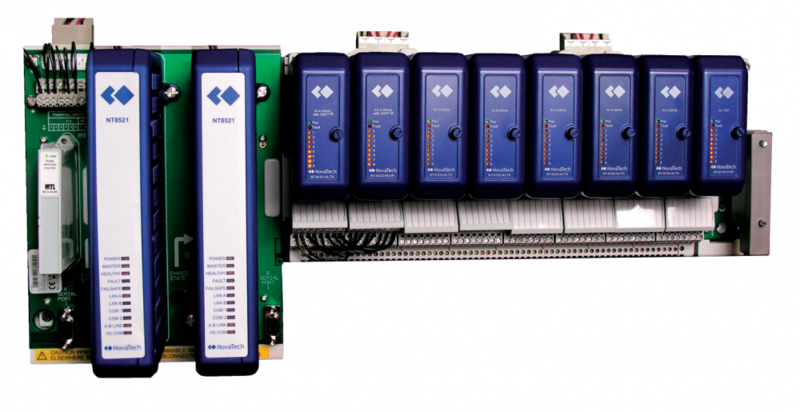 Up to 64 I/O modules can be supported within a single 8000 Series node, and each module has between 4 and 16 channels. A PCM EthernetMPC card can support up to 50 nodes. With the availability of intrinsically safe modules, 8000 Series I/O provides a solution for both general purpose and hazardous area applications – even within the same node. It requires an Ethernet Multi Protocol Controller (EthernetMPC) card and D/3 version 12.2-2 or higher. There is a wide range of module types, in any mix of 16 digital or analog input/output channels, with high channel density. Redundant Local Area Networks (LAN) and power supplies are supported, and Zone 2 and Division 2 hazardous area mounting and hot-swap capability is standard, and enclosures for Zone 1 and Division 1 are available. HART pass through and integrated (per-channel) fusing and loop-disconnect facility is supported. Bussed field power on carriers eliminates daisy-chain wiring at field terminals, and sophisticated mechanical keying system eliminates risk to plant and personnel. An 8000 Series node comprises single or redundant Ethernet Bus Interface Modules, up to 64 I/O modules, field terminals, and associated power supplies. Information from the I/O modules is transferred to and from the communication module (EBIM) via the Railbus – a fast serial data bus with parallel module addressing that extends over the full length of the node. The parallel address architecture means that each I/O module position has a unique address which eliminates the need to ‘train’ modules during installation. Power for the node is provided by integrated power supply modules; these convert the locally available power source into a regulated internal supply rail. This rail energizes the EBIM and all Railbus communication between the EBIM and I/O modules. For some I/O module types – such as those with low-power and intrinsically safe field circuits – it also provides power for the field wiring. Where additional power is required for field devices (such as high current AC circuits), power can be provided by means of cabled connections from each module to external relays. 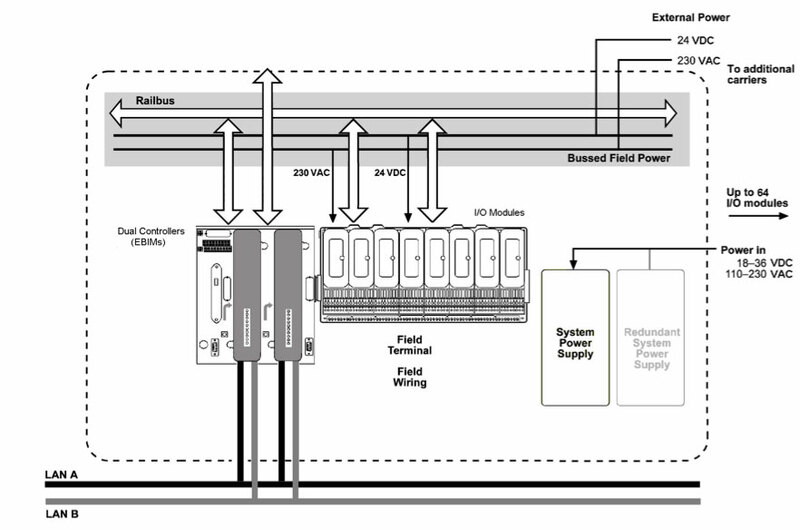 This Bussed Field Power facility reduces installation time by removing the need to make daisy chain wiring connections at the field terminals of each I/O module. The D/3 DCS requires the temperature from a particular thermocouple input at a particular node and transmits a signal on the I/O LAN. There are several Series 8000 nodes on the I/O LAN, but the EBIM at the chosen node recognizes its own node address, and acknowledges the request. At each node, the input modules constantly monitor, linearize and digitize their respective field signals, and make them available to scanning on the node’s internal Railbus. The EBIM continually scans the I/O modules via the Railbus, and builds up a map of the values of the input variables, ready for the PCM to read. These are converted into the LAN protocol and placed on the LAN by the EBIM, together with acknowledgement signals. The D/3 then interprets the signal and reconstructs the temperature reading. I/O modules transfer signals to and from field instruments. Input modules receive signals from transmitters and sensors and convert them into a digital form for presentation to the EBIM. Output modules receive commands from the EBIM and transfer them to actuators. A wide range of modules is available, including types for low-level instrumentation, AC circuits, and intrinsically safe signals. I/O modules typically have 4, 8, or 16 field channels. Carriers allow the 8000 Series I/O to mount onto a flat panel or T- or G-section DIN rail. They support and interconnect the EBIM, power supplies, I/O modules and field terminals, and carry the address, data and power lines of the internal Railbus. They provide termination points for the LAN and field wiring cable screens and can also distribute bussed field power to the I/O mod- ules. 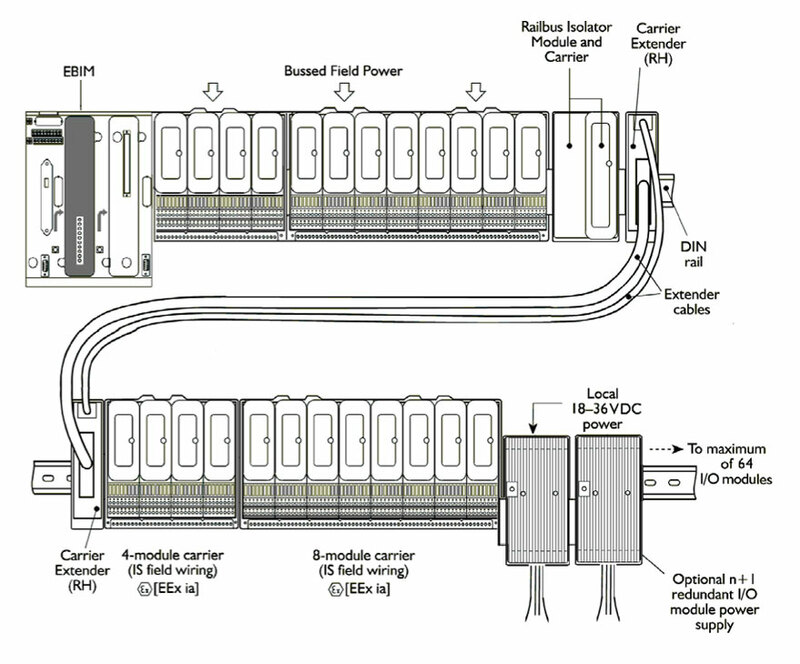 I/O module carriers support eight I/O modules. Field terminals provide the interface between the I/O modules and the field wiring. They include fusing and loop disconnect as options. A mechanical keying system prevents an I/O module from being connected to the wrong type of field terminal. Field terminals mount onto the module carrier, one to each I/O module. They are clamped firmly by the I/O module to form an electrical and mechanical assembly of high integrity. They may be replaced in service without removing carriers or disturbing the operation of other modules. 8000 Series I/O power supplies accept locally available unregulated power and provide a regulated supply for the EBIM and I/O modules. Supply redundancy is supported. The system power supply at an 8000 Series node converts the local DC supply to power the node, and can also provide field power for I/O modules with low-level field circuits. Where heavy-current or AC mains circuits are handled by the I/O modules, the 8000 Series method for distributing field power avoids complex wiring at the field terminal and minimizes the backplane/carrier wiring. 8000 Series I/O uses the Ethernet Bus Interface Module (EBIM) to provide a high speed Ethernet data connection to the D/3. The EBIMs communicate using a proprietary protocol over Ethernet at speeds of 10/100MB to the D/3 PCMs. The editors of “Control” magazine were on site at the 2017 NovaTech Automation Summit in Baltimore. They offer coverage of some of the Summit’s presentations addressing process control’s most interesting challenges and pressing problems. A one-minute-long, time-lapse video that shows the replacement of Quantum I/O with NovaTech 8000 I/O at the DAK Americas PET plant in Cosoleacaque, Mexico. By prefabricating fully populated and tested panels and then shipping them directly to the job site, NovaTech was able to utilize much of the existing field terminations and cabinet wiring, thereby reducing the installation time.